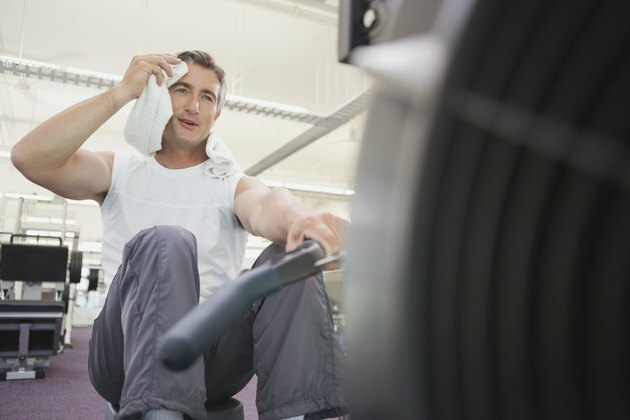 Rowing machines and exercise bikes provide non-weight bearing and non-impact cardiovascular workouts. The rowing machine engages muscles in both the upper and lower body while the bike primarily works the large lower body muscles. The recumbent exercise bike is a trainer's "first choice for elderly, overweight and deconditioned clients," says Pamela Contos, fitness director of Synergy Medical Fitness Center in Napa, Calif. Outdoor bicycling carries a degree of risk from vehicle traffic; indoor cycling provides the same fitness benefits without the risk. Upright bikes have a very small footprint, making them popular for home use. On recumbent and semi-recumbent bikes you lean into the backrest, and pedal with your feet in front of you rather than under, reducing the joint stress for overweight and obese individuals. "Jonny G." Goldberg created the indoor cycling bike in 1989. These bikes resemble street bikes. Instructor-led group cycling classes are often the most popular in the club, says Contos. Cardiovascular exercise benefits the body by raising the resting heartbeat, providing oxygenated blood to the body, increasing lung capacity and keeping the heart healthy. Cycling utilizes the lower body muscles--the largest muscle group in the body--and therefore burns calories at a higher rate rate than rowing. According to the National Strength and Conditioning Association's personal trainer's textbook "NSCA's Essentials of Personal Training," cycling engages the muscles in the front of the thigh, back of the thigh, groin and buttocks. A rowing machine has a flywheel that connects to a handle. You push your body backward with your legs, a move assisted by a pulley, and then pull with your arms to return. The effort recruits the biceps and back muscles, with contributions from the legs, abdominal muscles and shoulders. "NSCA's Essentials of Personal Training," stresses proper form with head upright, back straight, arms outstretched and knees flexed with the shins vertical at the start of the movement. The driving portion of the movement involves the legs pushing back, and the finish uses the back and shoulders to pull the handle to just under the rib cage. While rowing may be too strenuous for someone who's recovering from a heart attack, "Recumbent bikes are one of the first machines we put people on for cardio rehab. Both machines have settings to change the resistance, and as with all exercise, increasing the demand on your muscles translates to improvements in strength, endurance and recovery," says Conto. If you're not a farmer, competitive boxer, martial artist, swimmer or tennis player, most likely you are getting little or no exercise for your back. An exercise bike is versatile, but no cardiovascular machine comes close to a rower for developing the back. The rower is a cross-training complement to all forms of cardiovascular exercise, whether walking, running, cycling or aerobic step classes.